A lot of people never consider how much a door can change the “feeling” of a room. 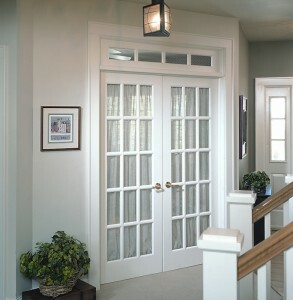 As the main entrance or a path to another room, a door is part of the home décor. Unfortunately, many people tend to view a door as just a utilitarian structure; it opens and closes and provides a way in our out. That’s it. Take another look at the doors in your home. Imagine the possibilities with one simple change – the trim. The doorway trim around the door frame is there for one big reason: it hides construction gaps between the frame of the door and the drywall. Most of the time, builders leave the casing very generic. The border around the door is just that, a border. But, you can install new doorway molding or update the trim you have now very easily. Two things to consider first: joint choice and sizing. Most builders use mitered joint for the basic casings. This allows for trim to connect at equal angles. Butted casing is usually used for homes with high ceilings. The head casing (that’s the top part above the door) is much wider and can be decorative and detailed. The width of door casing trim varies as well. Standard width is 2 ¼ but can go as higher than 3 ½. Of course, you could make your trim extravagantly wide and would need our custom millwork department to help. Which Wood Works for the Doors? This is about style now. Different wood matches your style and budget. There are three basic casings to look at: Hardwood, paint-grade wood and multi-density fiberboard. Hardwood casing is a great option for areas that might get more moisture than normal. This casing will not warp. It’s also a good choice if you are going to stain it. Hardwood can be more expensive and sometimes needs to be custom ordered. Paint-grade casing is the standard and can be painted. Usually, it must be painted if it doesn’t come primed because this casing is finger jointed – smaller pieces of wood were joined together to make the casing longer. Multi-density fiberboard is durable sawdust and resin and is probably the cheapest casing you’ll find. Don’t use in a bathroom or exterior door, though. It will swell if exposed to water. If you are thinking of changing the look of a room via the door or need new doors, be sure to come in and talk with our experts! We are ready to help! This entry was posted in Doors and tagged Custom Doors, custom doors madison, Custom Millwork, Custom Millwork Madison, door trim, Doors casing. Bookmark the permalink.